Happy Sunday! Today I made a card using the faux laser cut technique. Here is a video link showing how to make this type of card. Thanks for stopping by and checking out my post. Get creative and have a great day! This is a great card and interesting technique. Thanks for the pointer to the tut and thanks for sharing this very well crafted project with us here at 613 Avenue Create! Isn't that fabulous, thanks for the video link! Very pretty! Thanks so much for playing along with us at Inspiration Destination this week. This is so beautiful! Great look of the navy and white too! I love the blue and white together! The die you chose is beautiful and perfect for this technique! Beautiful card. Thanks for sharing with us at The Crafter's Cafe this week. This is absolutely beautiful..The contrast of white and blue is awesome. I adore that flower die-cut. I am so glad you joined us in our Challenge at Word Art Wednesday. We are beginning another challenge today so, hope you link with us again. Leaving you an inspirational verse as declared by Jesus to them that believe in John 6:39 and it says, "And this is the will of him who sent me, that I shall lose none of all those he has given me, but raise them up at the last day. " Have a blessed week! 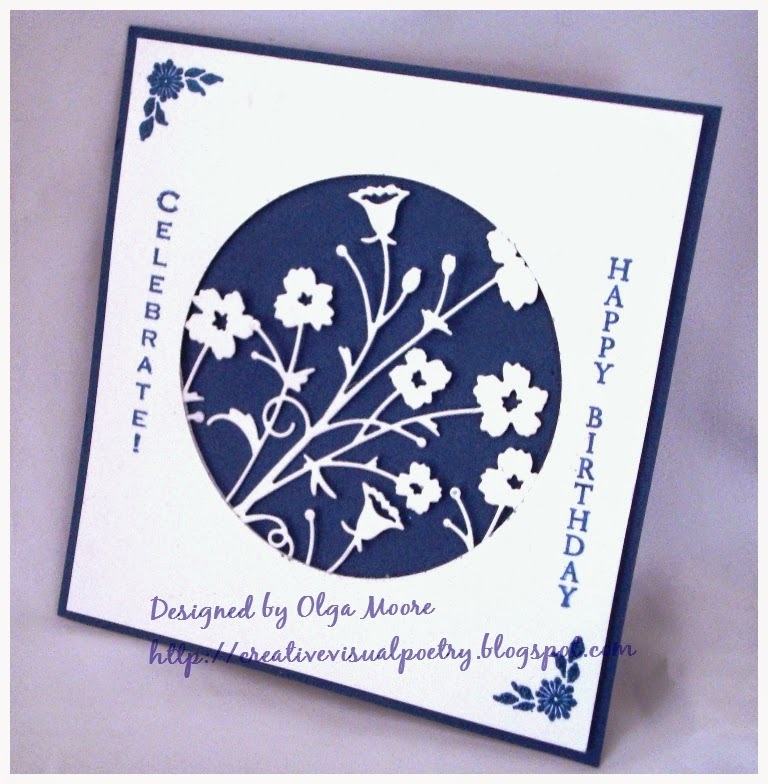 Thank you for sharing your gorgeous card with us at Crafty Cardmakers and More. Gorgeous, Olga! Love the blue and white combo. Thanks so much for playing in our "Anything Goes with a Sentiment" challenge at Aud Sentiments. Hope to see you again in our new challenge which starts later this week. This is simply gorgeous!!! Beautiful technique too!! Thank you for joining us at Sentimental Sundays.